AFTER a triumphant performance on the opening day of TRNSMT 2018, Pale Waves returned to Glasgow, this time to a sold out SWG3 for the first night of their UK tour. Indie-pop outfit Swimming Girls are the main support on this tour, and they kicked it off in incredible style. The undoubtedly 80s influenced indie sound this Bristol outfit churn out is unique, with intricate verses, and catchy, through the massive pop choruses they blast through. 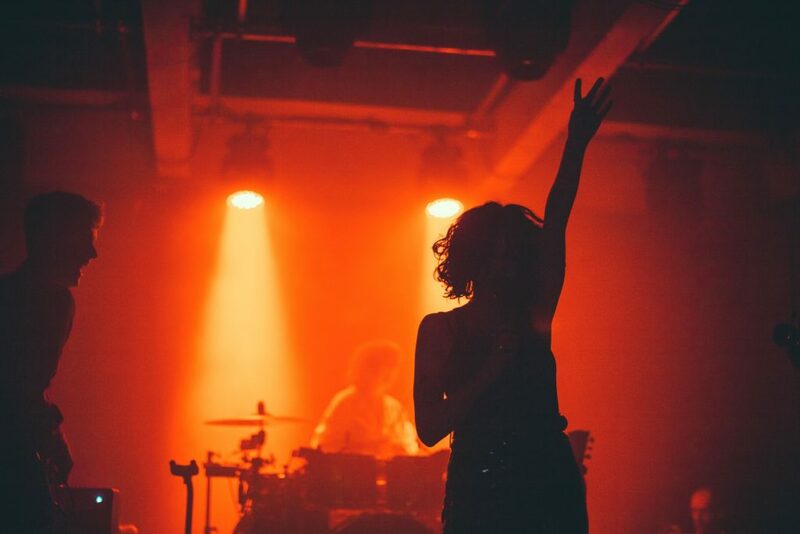 In typical Pale Waves style they took to the dark stage, electrified by intense strobe lights, to match their dark-tinged pop sound, launching into their opening tune, and arguably one of their biggest releases, ‘Television Romance’. The tune itself is an 80s drenched, alternative pop singalong anthem, placing the crowd in the palm of lead singer Heather’s hand. Throughout the set, Heather’s natural stage presence was impossible to ignore. Whether she is hammering her guitar through huge choruses or dancing through verses, she seems to enjoy performing not to the audience, but in her own world. Hot on the heels of the release of their debut full-length, ‘My Mind Makes Noises’, the set was peppered with album tracks, aside from their stream of singles. The album struck a chord with critics, and has certainly won over fans. The reception to tracks like ‘She’ and ‘Red’ was incredible, despite the album having only been in circulation for a week. ‘She’ was an undoubted highlight. The emotionally-driven, low-fi track was distinctly different to the indie-pop guitar sound the band have made their name with, but was still unmistakably Pale Waves in it’s raw emotion and flow. The entire set felt like a crescendo, leading to their encore. Closing the set on ‘There’s a Honey’ felt like the only way to go. The band’s breakthrough track, with it’s singalong choruses and the best representation of Pale Waves’ sound was ideal way to close, and the scenes and adulation from the crowd at this point was testament to the band’s unstoppable rise. With sold-out shows across the UK, the huge success of their debut album and jaunts across the world, everyone who tipped Pale Waves as one to watch for 2018 were absolutely right.